With just a handful of hours left in Bangkok before our night bus to Laos, my friend Laura and I hopped a public bus to Thailand’s massive Chatuchak Weekend Market. This market is open on the weekends, and since we were in town on a weekend the market was a must see. Allegedly, it’s massive that if you can imagine it, you can find it at Chatuchak — jewelry, clothes, wood crafts, pottery, knickknacks and doodads. You name it, they’ll have it. It’s likely true. The market is labyrinthine and colossal. Laura and I spent three hours wandering around the twisted rows of stalls in search of a guitar. Laura is convinced she needs one. And though we had a map, and though we were told they existed at the market, we never ended up finding section eight, there’s where we’re told the guitars live. We found heaps of crafts. We passed dozens of push-carts wafting the mildly unappetizing scent of grilled meats of all varieties — the Thai are carnivores, let me assure you! But the guitars remained an enigma. The guesthouse agreed to hold our luggage until our evening bus so we did a fair bit of touristy wandering while we searched the city for a guitar. We looked through every nook and cranny of space in Thailand’s markets. No guitars were forthcoming. 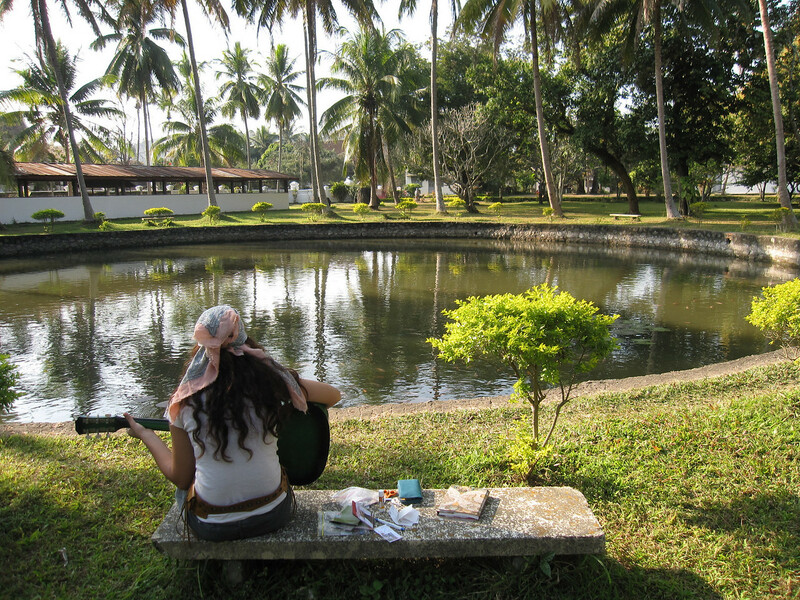 Although Laura can’t play yet, she wants to travel the world and learn the guitar from those she meets on the road. Since that’s awfully hard to manage without a guitar, we spent the day on a guitar-seeking adventure. By evening, we were exasperated, tired, and guitarless. Then the craziest thing happened. We found a friendly Thai man selling one single guitar. There it was: a lovely jade green guitar for sale at a shop about 100 feet from our guesthouse. Laura bought the guitar through a hilarious encounter. 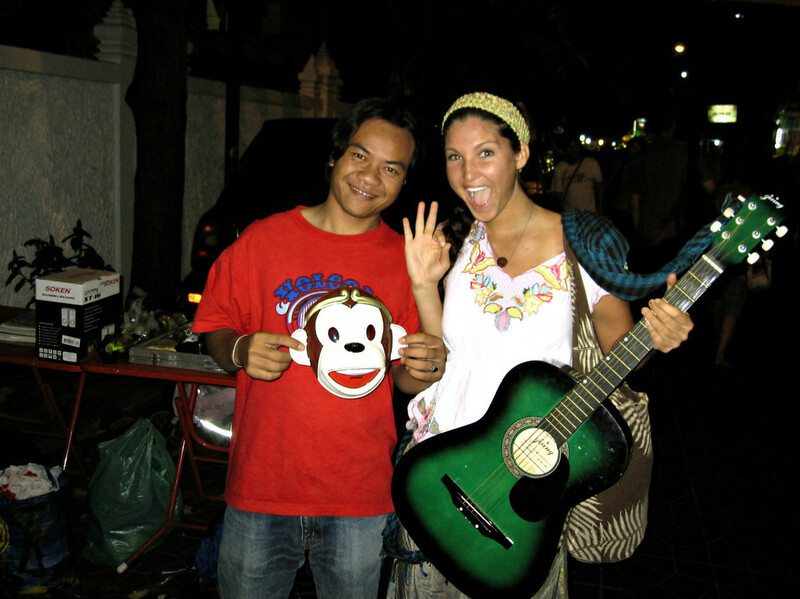 She bargained the man down to the last of her Thai cash, then she threw in a plastic monkey mask and he agreed to the exchange! The cost of this guitar? Just some cash and a monkey mask, natch. It was entirely ridiculous, but he laughed the whole time. He even put on the monkey mask! Riding on that high, we nabbed the guitar mere minutes before dashing to the corner to catch our overnighter into Laos — a 14 hour journey that had a couple of hiccups along the way. The bus itself was a psychedelic vision in bright reds and pinks on the interior, pompom curtains, and a freezing cold air conditioning. Our bus was built for ferrying tourists on the long cross-country journey. It was a huge double-decker VIP bus that I hear is popular on the backpacking circuit. They are inexpensive and the Thais decorate them in in the craziest designs. 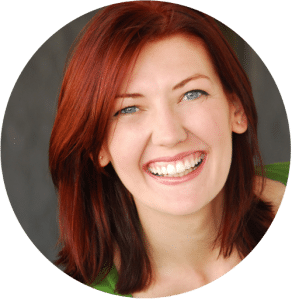 The seats were a standard fair, cozy to the point of cramped — there was a whole lotta love between me and Laura in our row!. The bus drove for hours into the night. We made a pitstop at a café in the middle of nowhere. It seems likely that the café was owned by the bus driver’s sister’s husband’s brother’s uncle’s mom, but it was well-stocked. We all piled out of the van and into the now freezing cold night. Everyone reboarded the bus with chips and snacks to pass the time. As Laura and I boarded the bus, we noticed that the lower level of seats were mostly empty. We both entertained happy thoughts of stretching out on the seats and getting a good sleep. As we waited for the bus to restart the journey, we piled our stuff into the lower section. Turns out, the only other person sharing the lower section was extremely ill.
We were both alarmed at first when the girl told us that she was sick. Stateside friends email me with a flurry of cautions, so thoughts of Avian Flu, tuberculosis, and a range of other undesirable diseases flashed through my head. Within seconds of the girl’s warning, she jolted me from my internal contemplation with a moment straight out of the Exorcist. For several minutes she heaved all over the bus. I won’t give the details, but Laura and I helped her as best we could. I ran back into the shop for a sporty beverage with electrolytes. Liz, hailing from Seattle, was traveling alone and had a case of food poisoning. Laura and I didn’t have to speak out loud to both realize that it easily could be one of us at some point. We took Liz under our wing. Helping Liz gave us each some extra travel karma, and it helped Liz since she was weak and teary. Helping Liz passed a good part of the journey. By 6am, the driver ushered everyone off of the bus and into the cold. They once again had us at a tiny café (brother’s friend’s cousin’s sister’s grandpa’s niece this time perhaps?) to fill out the paperwork needed for our Laotian visas. Once everyone had the proper paperwork it was back onto the bus. Then off again. Then on again. Then we disembarked with our belongings and everyone walked across the border. Once we were on the other side of the boarder — I made it to Laos! — they loaded us into a different, significantly smaller bus. Liz, Laura, and I are bundled against the cold as we cross the border from Thailand into Laos. 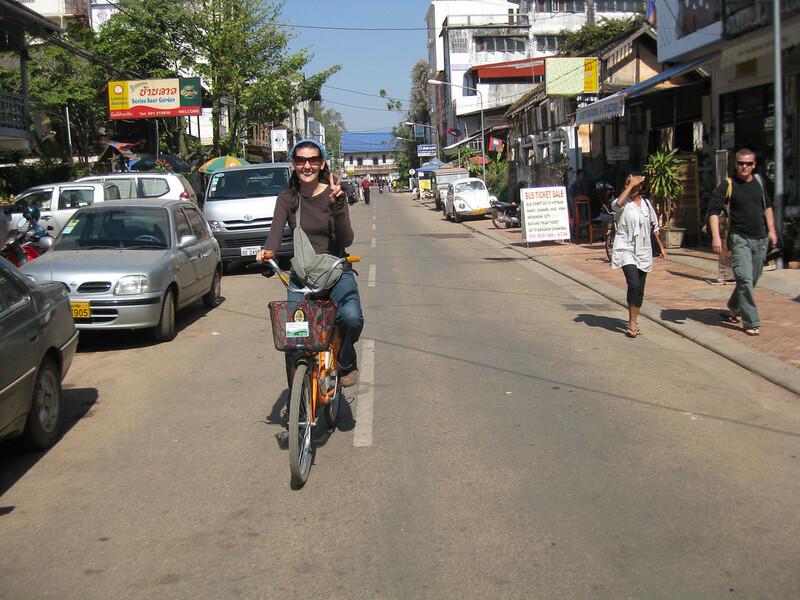 At that point, it was a short 30-minute ride to Laos’ capital city, Vientiane. Laura and I were officially dog-tired and Liz was still quite feeble. Together, all three of us headed to the closest hotel recommended in our Lonely Planet for a cozy and warm bed. Other travelers, and even the Lonely Planet, warned that Laos’ capital city lacked charm. Laura and I fell in love though. It was charming. Now that I’ve left Vientiane, it occurs to me that it might not have been the city. Vientiane was my first look at the people of Laos. Confession: I have a crush on Loatians. From the adorable waiter at the free WiFi internet café who humbly borrowed Laura’s guitar for an impromptu jam session to the genuinely welcoming Laotians at every breakfast nook, guesthouse, and bike rental shop — I am enthralled. 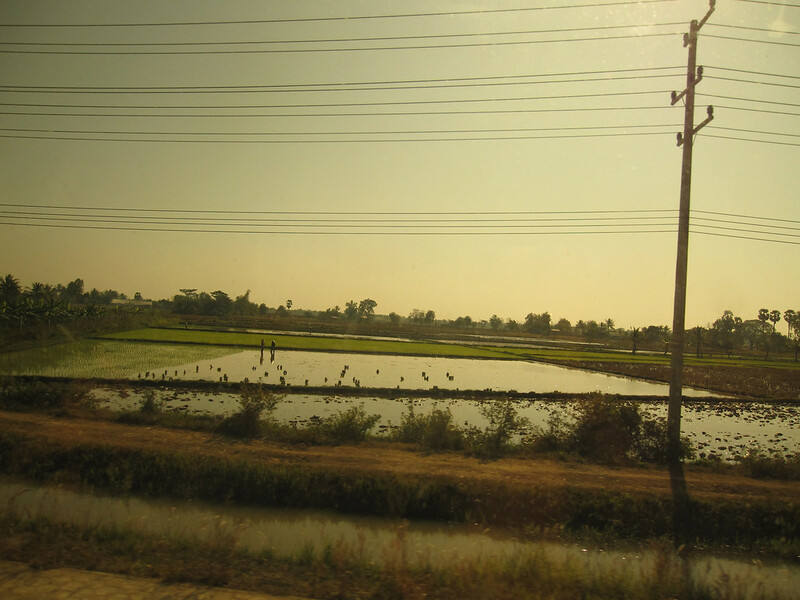 We didn’t stay in Vientiane for long — in fact we took a bus out the very next afternoon — but what we saw we thoroughly enjoyed. We rented bikes for half a day. Although we could have most definitely explored all of the main sights on foot, we both loved the feeling of flowing with the traffic and biking along the markets beside the locals. After our lazy morning of bike riding exploring, we bused it to Vang Vieng. It was a four-hour ride along the most beautiful scenery I have encountered thus far on my RTW trip. It was all sweeping vistas and rolling hills. Banana trees and rice paddies warred with palm trees to sprinkle their charm on the landscape. The hours passed with nostalgic realization that I had brought to life the images moves like Good Morning Vietnam. Laura and I arrived in Vang Vieng. I had an amazingly tasty red curry tofu for dinner. Now that we’re in Vang Vieng for a few nights, I plan to settle in and get good sleep tonight. We succumbed to the tourist trend and ate at one of the half-dozen Friends cafes plaguing the town. It feels kind of lame to have given in to the gimmick, but at the end of a long day, sometimes Monica, Chandler, Phoebe, and Rachel are a welcome accompaniment to dinner after two months on the road. Tomorrow the adventures begin. Vang Vieng is popular on the backpacker circuit. 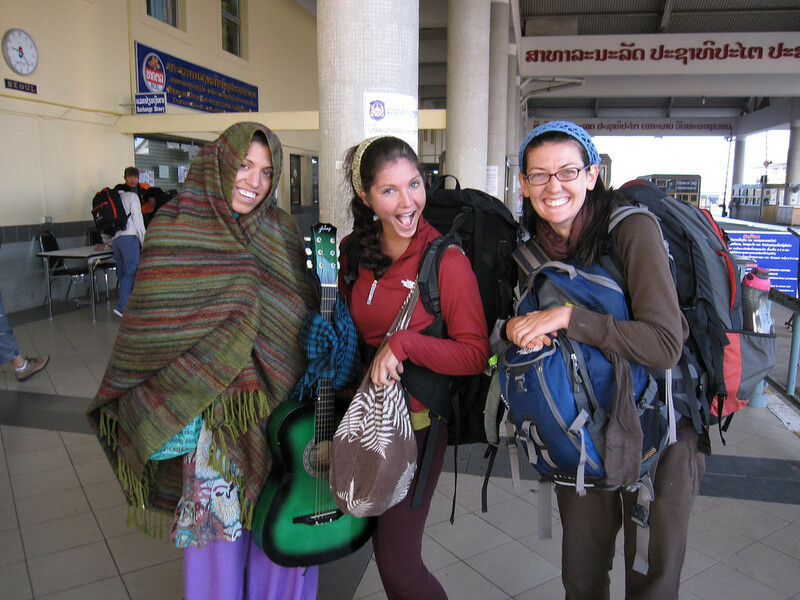 It’s a backpacker rite of passage in Southeast Asia according to those we’ve passed moving in the opposite direction. We’ve heard there is good fun to had here. There are tales of adventures on the Nam Song River, rock climbing, and a delicious mulberry farm. 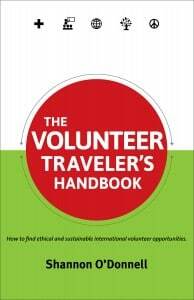 Where and how you cross into Laos depends on where you’re going, how long you have, and your level of adventure. The Friendship Bridge is on a well traveled route between Thailand and Laos, and it’s easy to land in Vientiane. From there, you can bus to Vang Vieng, and further bus onto Luang Prabang via an overnight sleeper or an all-day adventure. The Huay Xai crossing is in the mountainous north. Many backpackers head down the Mekong on a fast or slow boat after they cross into Laos here; it takes two days via slow boat if you go that route. Border Crossing: If you’re navigating the Friendship Bridge crossing from Thailand into Laos, this TravelFish page is updated frequently and has the latest information. Cross at Huay Xai: You can also cross into Laos much further north, at Huay Xai. I’ve done both, and they are both fairly simple. But the roads leading into Laos are better at the Friendship bridge. Thailand Travel Guide: After living in Thailand for several years I compiled all my best tips and resources for what know before you go to Thailand, as well as responsible travel in Southeast Asia. Where to Stay in Vientiane: The Beau Rivage Hotel is a good mid-range place with fant value to price ratio. I have stayed at Mixay Guesthouse before and it’s good but often booked up in advance. Niny Backpackers will do you if you’re looking for a good, affordable spot to land. I also use and love AirBnB, and they always have some properties open in Vientiane.